Gerberas are tender herbaceous plants native to South Africa and members of the Daisy family, Compositae (or Asteraceae). The plants produce numerous long stalked daisy like blooms in a variety of colors. They are best suited as potted plants or annuals in cooler climates, but in the deep south of the US, they may be grown outdoors as perennials. Gerberas thrive in a rich loamy soil with peat and compost and a scattering of sand. Small seedlings should be kept moist and shaded until they are firmly established. Established plants should be planted in full sun and well watered during the growing season, but once growth has slowed in the fall, they should be kept drier, only being watered when the soil is completely dry. If growing the plants outdoors in very warm climates, they should be planted in a well drained soil enhanced with compast or leaf mold and sand, if necessary. The soil should be worked to about 12 inches. Seedlings should be spaced at 12 inches apart each way, being careful not to cover the crown. Propagation is carried out by means of cuttings taken from basal shoots in the spring and by sowing seed. Cuttings should be inserted into a sand/peat mixture and kept in a covered box until they root. Once a good set of roots has formed, they should then be transplanted to pots. Seeds should be sown in a sand/peat mixture and kept moist and covered with plastic or glass until seedlings appear. Once seedlings reach about 2 inches in height, they should be transplanted to pots and grown on. Gerbera leaves have been made into poultices and used to treat wounds. 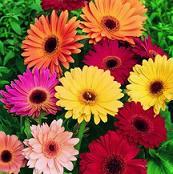 Festival Mix - Gerbera jamesonii - Annual - Early blooming variety with bright 3-1/2in. daisy blooms in shades of yellow, cream, pink, red, salmon, orange, rose, peach, bronze and mahogany. Good container or border plant. Full sun; plant height: 10in.